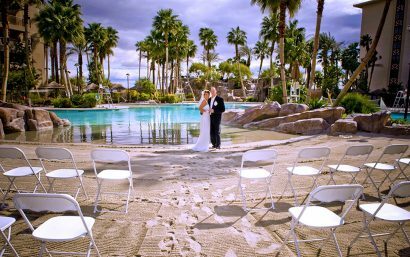 At Tahiti Village, we believe that your wedding ceremony should reflect your style and values as a couple. This is why we are proud to offer a wide variety of options to help better customize your special day. 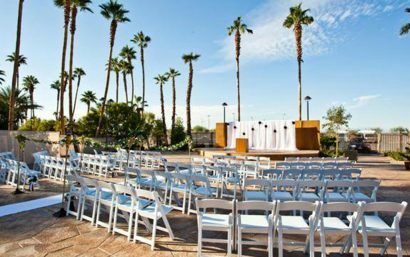 Whether you’re looking for an intimate and natural setting, or something more luxurious, the wedding ceremony of your dreams is possible at Tahiti Village. With four distinct wedding packages, you and your future spouse are sure to find the perfect place to say, “I Do.” We also offer a broad range of ceremony enhancements, including everything from photography services to custom colored rose petals to make your Las Vegas wedding ceremony truly unforgettable! Say “I do” in this spacious 10th floor room with two outdoor balconies. Breathtaking sunsets and expansive vistas from large windows make a memorable setting for your Tahiti Village Las Vegas wedding. 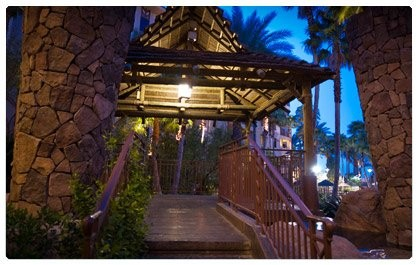 Walk barefoot down a sandy aisle strewn with rose petals, then recite your vows at the edge of our lagoon. Conclude with a unity sand ceremony that symbolizes the start of happily ever after. It’s the beach wedding ceremony you’ve always imagined and more. 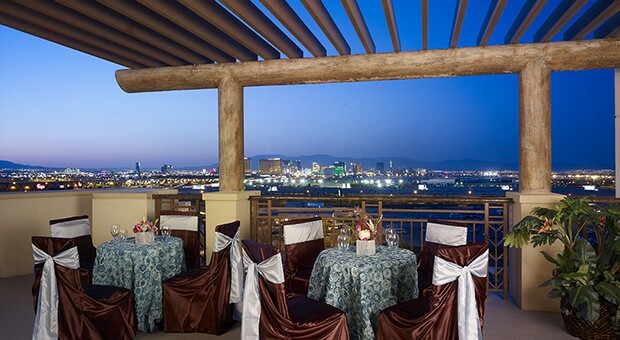 For Las Vegas weddings large or small, consider the Island Courtyard with its expansive patio. Set at the end of a winding garden walkway, this courtyard provides ample room for décor to personalize the setting to your wishes. Our optional wedding ceremony enhancements can add a special finishing touch to your special day. We are also here to help assist when it comes to finding a celebrant. If there’s something you’re looking for and it’s not on the list, please don’t hesitate to ask. We may be able to assist you with referrals to local services including floral, cakes, photographers, wedding gown or tuxedo rentals, and more. After your romantic nuptials, it’s time to celebrate with your guests at the reception! We offer everything you need for a fun and beautifully executed wedding reception. Whether you are looking for a large space with plenty of room for dancing, or somewhere with stunning views of the Strip, you are sure to find it at Tahiti Village. 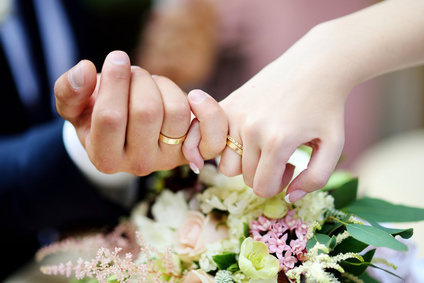 Our well-equipped wedding packages combined with optional enhancements provide everything you need for a great time. 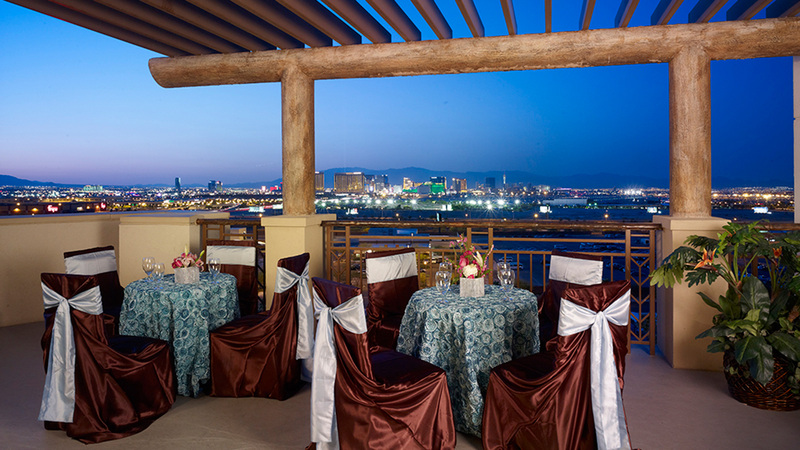 Celebrate in style with a reception at Tahiti Village, one of the best wedding venues Las Vegas has to offer. Contact us today online, call us at (702) 639-8333 or email banquets@tahitivillage.com and one of our talented event specialists will help you manage all the fine details so you won’t miss a moment.